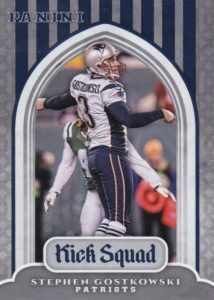 Back for another season, the 2017 Panini Football checklist works heavily with a medieval theme to bring NFL collectors a variety of choices. Similar to the 2016 set, formats include Retail, Blaster and Fat Pack boxes with exclusive options found in each. 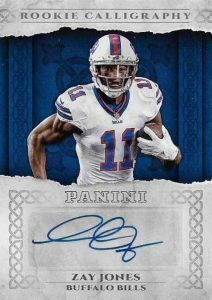 Showcasing the top 2017 rookies in their NFL uniforms, 2017 Panini Football ushers in the next phase in the collecting season. 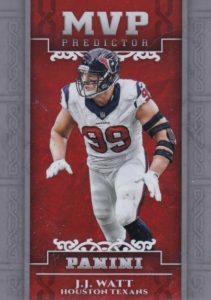 Enhancing the base set are Bravery die-cut parallels (Base #/399, Rookies #/199), exclusive to Blasters, Chivalry die-cut parallels (Base #/399, Rookies #/199), only found in Fat Packs, and Sacrifice die-cut parallels (Base #/399, Rookies #/199), specific to Retail boxes. Knights of the Round die-cuts are a case hit featuring a distinct design. 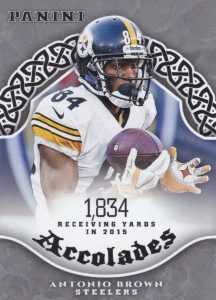 Giving collectors a shot at winning exclusive cards, Predictor cards let collectors take their best guesses for MVP, Offensive Player of the Year and Offensive Rookie of the Year. 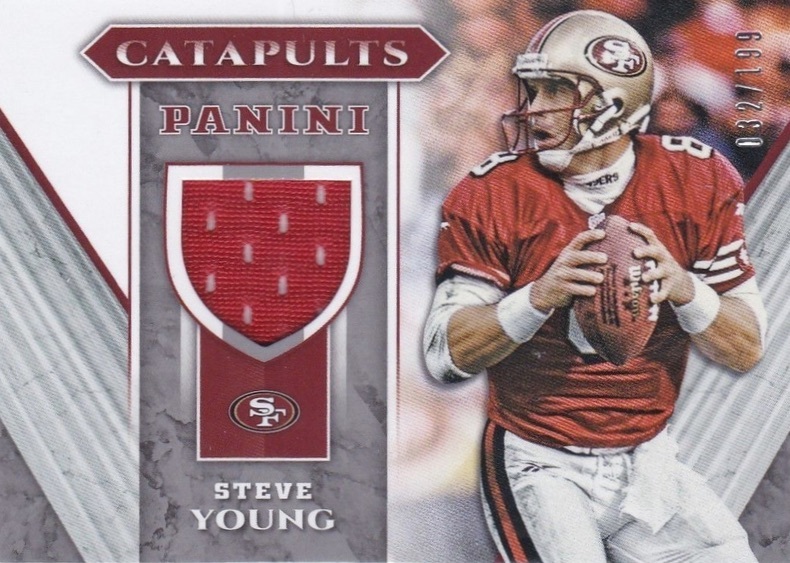 There are also Gold (#/10) and Black (1/1) parallels. 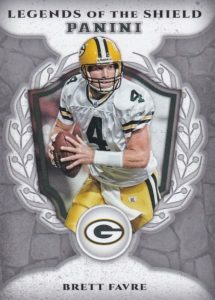 Among the other inserts are Accolades, Kick Squad and Legends of the Shield sets. 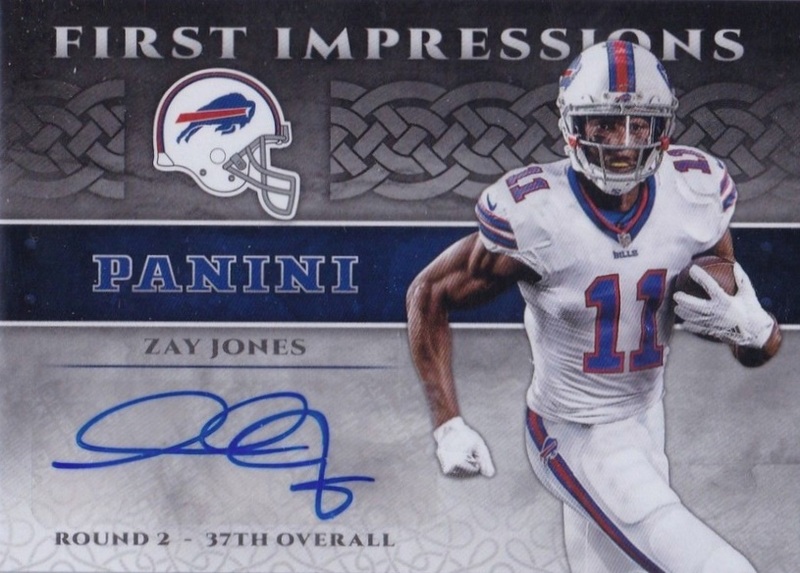 Also paying special attention to the rookie class, the 2017 Panini Football autograph lineup includes First Impressions, Heir to the Throne Signatures and Rookie Calligraphy cards for key first-year players. 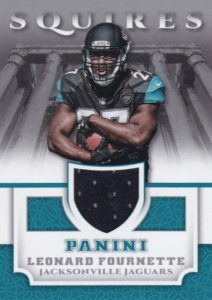 Promising the first relics with rookies in their NFL uniforms, the Squires Jerseys set has a base version and Prime parallel (#/25). VETERANS PARALLEL CARDS: Chainmail Armor, Knight’s Templar, Shining Armor, Bravery #/399 (Blaster), Chivalry #/399 (Fat Packs), Sacrifice #/299 (Retail Box), Blue Knight #/99, Red Knight #/49, Gold Knight #/10, Black Knight 1/1. ROOKIES PARALLEL CARDS: Chainmail Armor, Knight’s Templar, Shining Armor, Bravery #/199 (Blaster), Chivalry #/199 (Fat Packs), Sacrifice #/199 (Retail Box), Blue Knight #/99, Red Knight #/49, Gold Knight #/10, Black Knight 1/1. PARALLEL CARDS: Green #/399, Red #/25, Gold #/10, Black 1/1. 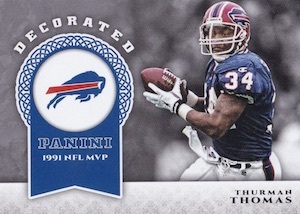 PARALLEL CARDS: Prime #/25 (*No Warren Moon). 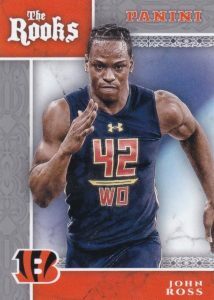 PARALLEL CARDS: Prime #/25 (*Mathis - #/15; Bell, Peterson - #/10). 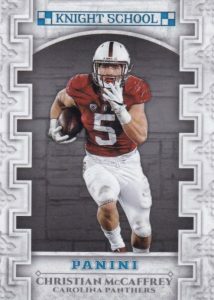 One thing I LOVED about last year’s product is what they’re doing this year: one rookie per pack! I hate when rookies are overloaded per pack cause it devalues them.. also, one insert per pack makes for a pretty nice pack..
Is this set actually out yet? Can’t find it anywhere. Links to images of cards in set much appreciated! They have these on ebay right now for $19.99 a box. 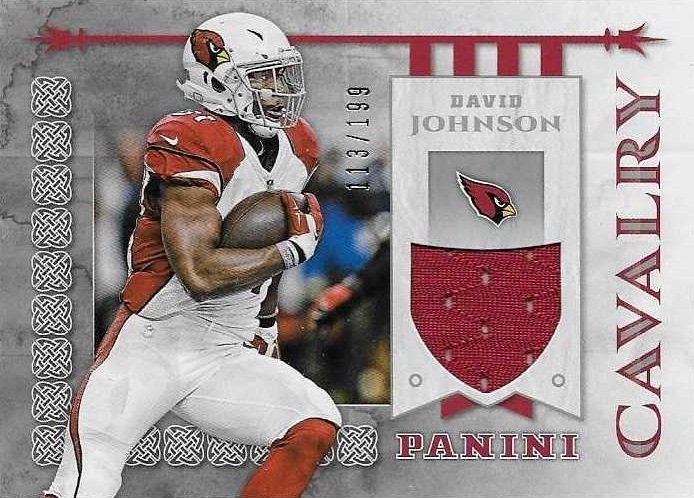 How could Panini leave David Johnson out of the BASE set? He led the NFL in TOAL YARDS. Poorly done! these cards. 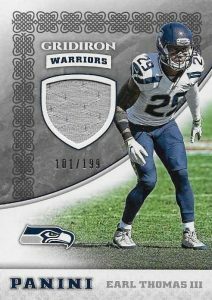 Set has a good amount of rookies and inserts. Got to be the ugliest set ive ever seen. 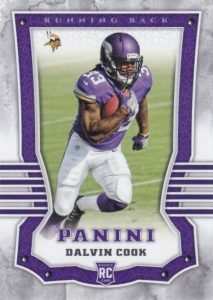 Worthless Panini…..Topps come and save us football card collectors! Bought a retail box at Target for $20. The box contained a Philip Rivers and D’Onta Foreman relics, and gave 2 green parallels numbered to 399. But, some cards had frayed corners and several of the cards had a strange scratch across the width of the card. Not sure if it is purposeful or a machine error. Was the first retail box I had bought in a while and wasn’t thrilled, but not a terrible buy for $20. All in all though, I wouldn’t recommend it. 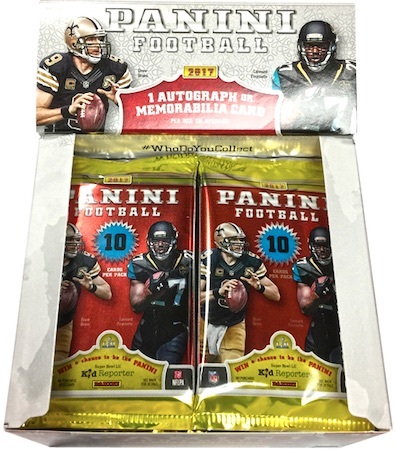 2017 Panini Football Factory Sealed 24ct. Retail Box. 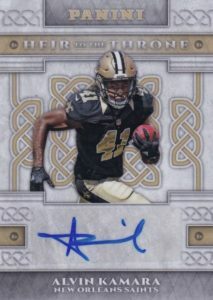 24Pk 10 NFL Cards 1 Hit.